FreshBed prevents excessive perspiration by using temperature control and ventilation to keep humidity in the bed well below 50%. This creates the conditions for optimum comfort and keeps your bed free of moisture, mould, bacteria and house dust mite. Try if you dare to imagine the truth: there are over a million house mites in every mattress older than one year. It’s the excrement of the house dust mite that poses the problem and causes allergic reactions. FreshBed’s ventilation system was developed to give you the perfect night’s rest. Fortunately, thanks to the system’s ingenious acoustic insulation technology, the system operates silently – a handy feature in a bed! 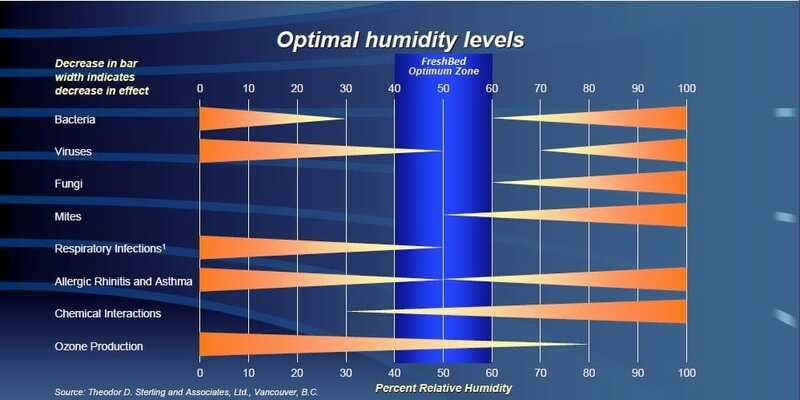 In addition, FreshBed’s ventilation system is highly energy-efficient. If you compare what you would normally spend on air conditioning or traditional heating of your bedroom, FreshBed actually saves you money. Air quality in the bedroom is also improved as FreshBed uses a medical Hepa filter. Not only does this filter remove dust and bacteria from the air, it also removes pollen, particulate matter and the secretions of the house dust mite. FreshBed creates a comfortable, fresh and clean microclimate to guarantee you a perfect night’s rest.